Even Hillary Clinton, recipient of Planned Parenthood’s Margaret Sanger Award for Excellence in Supporting Elimination of the Darker Races Through Progressive Eugenics, is unable to support Planned Parenthood’s commoditization of human life and inhuman methods. But Mrs. Clinton still supports abortion on demand! Editor’s Note: This originally appeared at The Ancient & Noble Order of the Gormogons. Planned Parenthood is now fighting for its life, and rightly so. Planned Parenthood’s assembly line, dehumanizing abortion mill procedures cannot withstand scrutiny. So long as Planned Parenthood publicly said the right things (e.g., “abortion should be safe, legal and rare,” “women’s health,” etc. ), America was content to ignore Planned Parenthood’s charnel house ethics. But these tapes destroy the veil of willful ignorance Planned Parenthood depends upon for its survival. If you can watch these videos without viscerally loathing Planned Parenthood’s ghoulish leaders, you’re a far better person than I. If you can watch these videos and still unquestioningly support Planned Parenthood’s abortion operations, you’re morally damaged. Editor’s note: United Liberty recognizes the divide amongst libertarians over the abortion issue and that there are strong, but thoughtful feelings coming from both sides. This piece covers an important issue that has been neglected by the mainstream media. It does not necessarily reflect the views of United Liberty or every contributor. Murder. Exploitation. Blood money. Intrigue. The story of Kermit Gosnell has all of this and more, a story which is filled with horrifying and sensational details, a story of such heartless depravity and gory death that it could have been a George Romero film. So why it that you are almost guaranteed to have never heard of Gosnell? That is an excellent question, and one that anyone who believes in a strong and independent free press should be demanding answers to. If there was ever a case of clear-cut media bias and cover-up, this is it. In the final season of The West Wing, Matt Santos, the fictional Democratic Party presidential nominee, got into a contentious discussion about abortion with the spokesperson for the Women’s Choice Alliance, a pro-choice special interest group. “And we’re surprised that there are people out there who think we’re for unlimited abortion. That there are actually voters, who are pro-choice, that think that we’re too extreme,” he added. Seems reasonable, right? Even though abortion is legal, no one should be proud the controversial practice, which often involves women who are placed in a difficult situations where they feel they have to make such a life-changing decision. 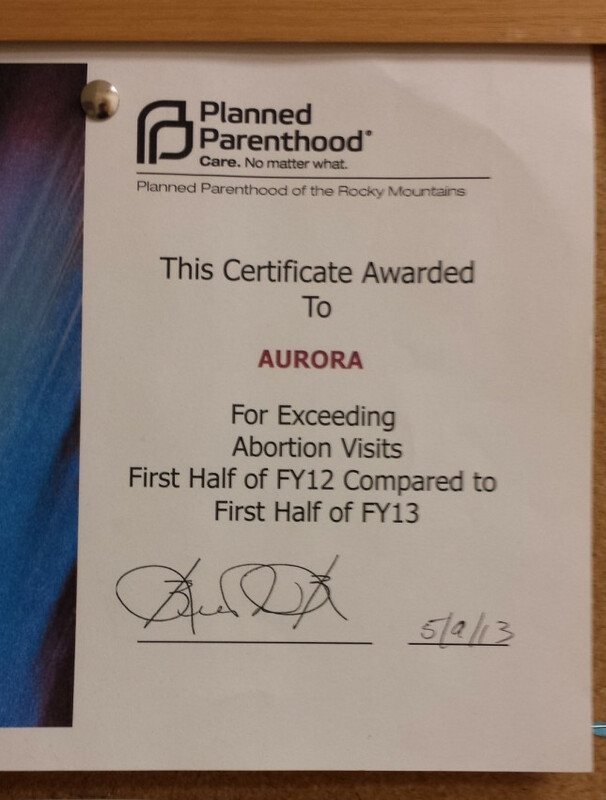 Unfortunately, Planned Parenthood of the Rocky Mountains is allegedly handing out awards to local affiliates that exceed the number of abortions they performed compared to the previous year. Here’s a photo of the award provided by And Then There Were None via LifeSiteNews.com. Will Abortion Go the Way of Slavery? Is abortion in the United States destined to go the way of slavery? A moral evil considered a stain on the conscience of a nation, which future generations of Americans will look back upon with shame and derision in the same way we treat with contempt the thought that anyone could have ever attempted to justify slavery? While it may seem unfathomable to contemplate, considering how commonplace abortion has become in America since the ruling in Roe v. Wade, it may not be as far-fetched as you might think. Its ubiquitous presence today may be the very catalyst that drives it from our social landscape. Since the Roe ruling, there have been more than 56 million unborn children aborted in America. Think about that for a moment. In the last four decades, we have killed in the womb enough children to equal the populations of Illinois, Pennsylvania, Ohio, Michigan, and Georgia….COMBINED! That is nine times more innocent lives taken than Jews that were killed by Adolf Hitler in Nazi Germany. That is the equivalent of wiping out the entire population of Italy today. Today we talk of abortion in politically-correct, sanitized terms like “a woman’s right to choose” and “reproductive rights”. It is considered uncouth to discuss in morbid detail the brutal process that the child endures during an abortion before being tossed out as medical waste. To allow ourselves to consider these things would be gruesome indeed, and difficult to reconcile in a nation where we routinely violate private property rights and shut down major construction projects in order to protect the habitat of some snail or lizard. After several months of delays, the Obama administration awarded $67 million on Thursday to fund an army of outreach and enrollment workers known as “navigators,” who will help people sign up for coverage on the new state health insurance marketplaces beginning Oct. 1. With less than seven weeks to go before the marketplaces start enrolling people in Obamacare for 2014, more than 100 navigator programs will be on a tight schedule to assemble, train and dispatch workers throughout the 34 states that will have federally run marketplaces. The 16 states that run their own marketplaces fund their own navigator programs. Among the organizations receiving money is Planned Parenthood, which is the single largest abortion provider in the United States. Three separate chapters affiliated with Planned Parenthood operating in six different states will receive $655,192 in ObamaCare navigator funds. Most Planned Parenthood clinics are considered to be “essential community providers” under ObamaCare, thus requiring insurers to pay for patients’ visits. As a woman, watching what’s happening in Texas is a study in dichotomies. On the one hand, the right to speak about reproductive rights at all is fairly astonishing and heartening given the relative inability of women the world over to do the same. On the other, the most hateful among us appear to be squandering that precious gift by — well — chanting “Hail, Satan!” at people who have a different take on reproductive rights (read: the right to reproduce), and celebrating being a “ho.” Pretty sure that’s not what the early crusaders for women’s rights in this country had in mind, but whatever. Times change. What does not change, however, is the human tendency — particularly in politics — of those on the side of a losing argument to devolve their protestations into puerility and desperation, both in an attempt to gain attention to “the cause,” and to shock and offend; because shocking and offensive behavior drives the news cycle, and the news cycle (in theory) determines relevance. Hence, the very ridiculous images and videos coming out of Texas as they debate late-term abortion.